Peshawar Zalmi won the toss and will bat first against Islamabad United. #PeshawarZalmi has won the toss & will bat against @IsbUnited . Let the game begin! Anyone else watching the #PSLT20 coverage on Prime TV in the UK and confused by this ****ty mattress ad? It's Isb United - Here we go! Inshaallah Peshawar Zalmi champion hoga. Karachi Kings Ne Lahore Qalanders Ko 8 Wicketon Se Shikast Day Di, Lendl Simmons Aur Shakib-ul-Hassan Ki Nisf Centurian. Peshawar Zalmi won the toss & elected to bat. Get ready Peshawarites @PeshawarZalmi is waiting for our support. Awwww "APS" Students sitting in the Ground. 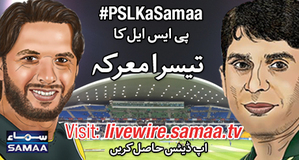 #PSLT20 Peshawar Zalmi vs Islamabad United, Zalmi have won the toss and elected to bat first. #PSLT20 Zia ul haq looks a good prospect. Can swing both ways at a decent pace. Thnx Javed Afridi for bringing #APS children to #Dubai to watch #PeshawarZalmi Vs #IslamabadUnited in #PSLT20 . This is the first time I am watching quality Pakistani cricket without any fear of losing!